Renton has excellent timing, as we all know. Thursday morning he waddles up to where Steven I are getting ready for work and sighs out a low, mournful meow. After checking him out — hot to the touch, generally pissed off — we surmise he is yet again overly constipated and sporting a urinary tract infection. Quick plans are made for Steven to take off work that afternoon to make a vet visit. I make the call to the vet and stress multiple times that this is the BAD CAT that wants to eat your soul. Sure enough, constipation is the nature of the beast, so to speak, and the vet is both impressed and worried about Renton’s bowels (of Hell?) and keeps him overnight. Mom calls me the next morning at work to see how poor Renton fared. No word yet so I assured her I’d call once I spoke with the vet, whose number I was looking up right that minute. I spoke with the vet — “Bowels clear; what a lot of poop!” — called Steven while Mom tried to call me back, tried to call Mom back without success, received text message from Dad, tried Mom again and finally got her. Ahh. Here’s where we realize Renton’s excellent choice in timing. After much deliberation, plans were made to have a slightly early weekend, pick up child and cat and converge upon the house. First things first — Renton had to be thoroughly bathed. When I first saw him he was as happy as could be to see me but LORD HAVE MERCY did he stink! His typical treatment for the constipation issue is sedation and an enema or three. Bathtime for Bonzo. Then we packed up and down to Auburn we headed — everyone was expecting Miss Elizabeth to be around early evening, going by my now seemingly easy experience. It turned out Cathy had been in labor since early Thursday evening and after 30 hours and slow progression a Cesarean was performed. My strong sister went through way more than I ever have, yet there she was the next day looking over the legalese-type birth certificate paperwork. I didn’t mess with that until a couple of weeks later and it was because I happened to run into it when I was tidying up the office. 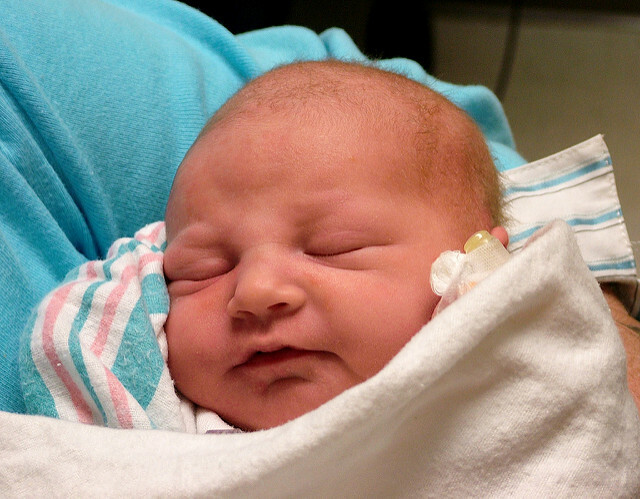 So, after this long, overly drawn-out post, I do present to you my niece, my sister’s firstborn, Miss Elizabeth Rebon Summers, arriving at 10:53 p.m. on the 26th of September, 2008, weighing in at 7 pounds and 7 ounces and measuring at 21 inches long. Her and Lydia shall dance together.